That is a swanky decorative tin. 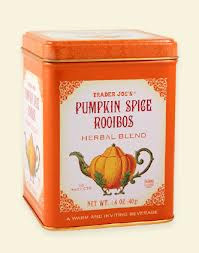 TJ's used to have pumpkin flavored coffee, I used to like. Do they still have it? My tea friends would like this. I believe I saw the pumpkin coffee! I do not buy coffee unless it is the single serve SB instants. I know bad me but we do not drink much coffee here unless it is out!